Lullaby Earth, made by Naturepedic, is a new affordable lightweight crib mattress company that is completely free of harmful chemicals and allergens. The GreenGuard Certified mattresses are completely free of polyurethane foam (including “soybean” foam blends), vinyl/PVC, polyurethane coated nylon or damask, PFC water-resistant treatments, dangerous flame retardants, and antibacterial biocides and the various chemicals associated with these materials. Lullaby Earth was able to achieve fire protection with hydrated silica, a harmless natural mineral. The 7 pound mattresses are made with a food-grade polyethylene (PE) core and cover and polyethylene terephthalate (PETE) cushioning, which protects the mattress from dust mites, bed bugs, mold, and mildew. Lullaby Earth is the only other eco-friendly crib mattress, besides Naturepedic, to receive the GreenGuard Certification for all 3 levels. This means the product cannot release any chemical emissions. Crib mattresses aren’t regulated other than for some phthalates and lead content. This means dangerous flame retardants, dioxins, antibacterials, pesticides, dyes, bleaches, and other VOCs can be inhaled by a sleeping infant for up to 16 hours a day. 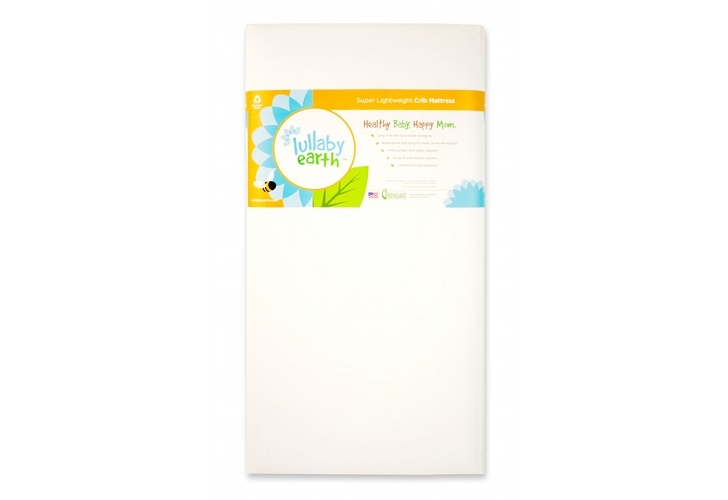 Right now Lullaby Earth sells 2 crib mattresses – the Super Lightweight Crib Mattress and the Super Lightweight Crib Mattress 2-Stage. The 2 stage mattress can be flipped over for extra support when converted into a toddler bed. Both mattresses are waterproof and can be wiped clean with soap and water. They are allergen free and contain no harmful chemicals. The mattresses are also 100% recyclable, are made in the USA, and come with a lifetime limited warranty. Lullaby Earth, made by Naturepedic, is a new affordable lightweight crib mattress company that is completely free of harmful chemicals and allergens. 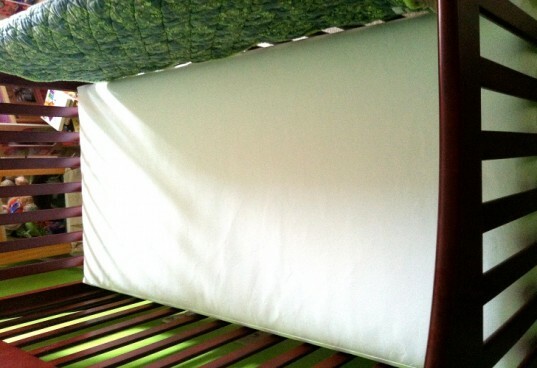 The GreenGuard Certified mattresses are completely free of polyurethane foam (including �soybean� foam blends), vinyl/PVC, polyurethane coated nylon or damask, PFC water-resistant treatments, dangerous flame retardants, and antibacterial biocides and the various chemicals associated with these materials. Lullaby Earth was able to achieve fire protection with hydrated silica, a harmless natural mineral. The 7 pound mattresses are made with a food-grade polyethylene (PE) core and cover and polyethylene terephthalate (PETE) cushioning,�which protects the mattress from dust mites, bed bugs, mold, and mildew.